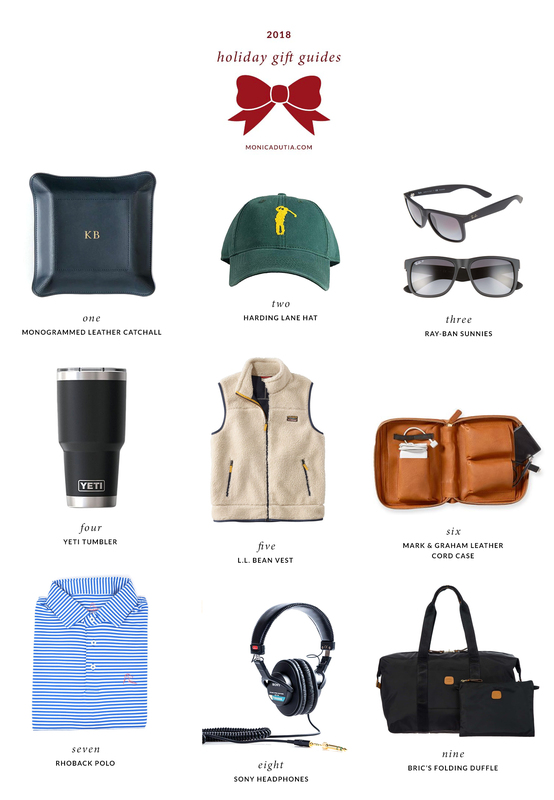 Today’s gift guide is for the guys in your life, aka usually the most difficult to shop for! There’s a good variety of stuff on here that will hopefully get the wheels turning even if nothing specifically works for the guy(s) on your list. J owns many of these items and they’re ones he uses often, and I own the women’s version of some, too. 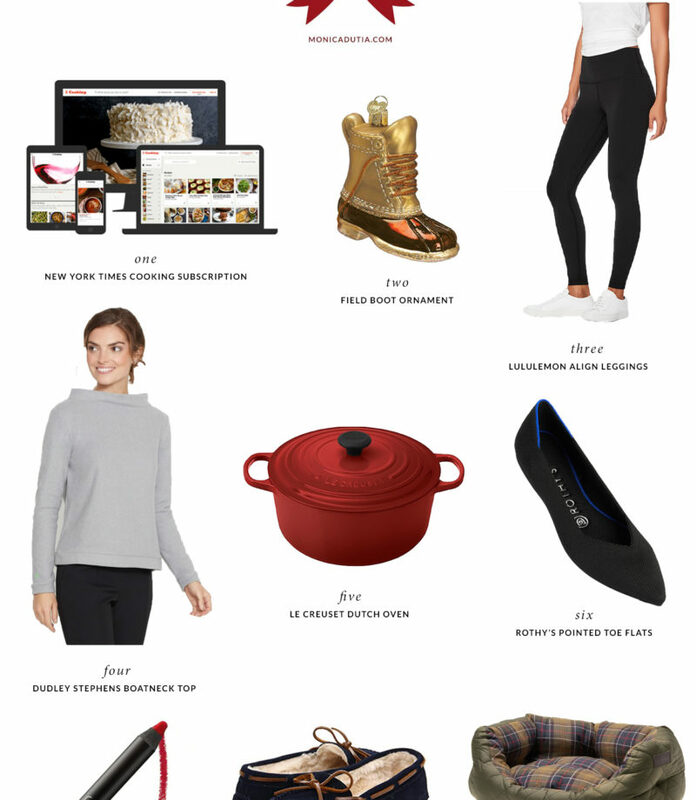 One more site update regarding gift guides: There’s now a page under the “Holiday” dropdown called “Holiday Gift Shop,” where you can shop the items from all my gift guides in one place. 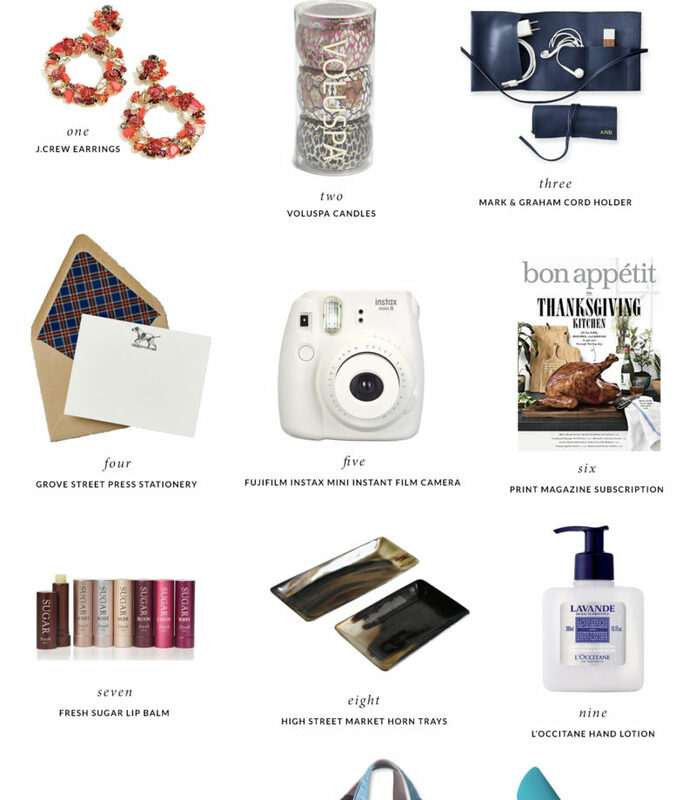 The items are labeled by category and I’ll be including more things relevant to older gift guides, too. Hopefully this is helpful for some of you who like to view everything in one place, rather than broken down by category! + MONOGRAMMED LEATHER CATCHALL: Many men wouldn’t splurge on a nice catchall for themselves and this is simple, classic, and practical–the perfect thing to keep by the door, on the nightstand, or on a dresser. + RAY-BAN SUNNIES: A spin on the traditional wayfarer–I wasn’t sure how much I’d love this style in person but they’re so great I’ve even borrowed them a few times :) They’re a little more casual but still have the classic silhouette that’ll keep them timeless. + YETI TUMBLER: J drinks out of his YETI tumbler every day and I’m still in awe that something that doesn’t seal all the way (like has a screw on/off top) keeps ice from melting overnight. I think their prices have dropped since they first came out and they’re much more affordable now! If you want to splurge, consider a cooler like this or this. + L.L. BEAN VEST: Like the Sweater Fleece, this vest will consistently make my “best gift” list because I’ve seen how much J wears and loves his and have the women’s one myself. It’s just as practical for the outdoorsman as it is for someone who’d wear it more on the weekends or as a secondary layer! We find ourselves packing them for most trips between October and April. + MARK & GRAHAM LEATHER CORD CASE: The number of cords we all carry on a day to day basis is kind of ridiculous but luckily retailers have decided to capitalize on that and create some great options for staying organized. I like this case because it has room for more than just cords and the pockets are large enough for devices, little notebooks, folded documents, etc. + RHOBACK POLO: A great moisture-wicking polo by an awesome business, Rhoback. I love the variety of color options and the price, and I’ll also take any opportunity to support a growing small business. Their hats are great, too! + SONY HEADPHONES: J keeps saying these headphones are next on his list and that they’ve been written up as some of the best, so that’s good enough for me! AirPods would be another option, if they’re looking for something more compact and commuter/workout-friendly. + BRIC’S FOLDING DUFFLE: I’ve mentioned Bric’s bags a few times but they really do make great gifts! This one folds up, is insanely lightweight and water resistant, and is on sale. P.S. Gifts for your coworkers, around $100, coffee table books (one of my favorite things to give! ), my own list, and more. P.S.S. An easy and delicious budget-friendly gift.